There is a range of opinions on whether oral arguments for ex parte appeals at the PTAB are helpful for the applicant. On the one hand, statements made during oral argument can count as admissions used against the applicant in an affirmance. Plus, some PTAB judges give the advice that they see no benefit in oral argument. Further, the PTAB has typically maintained the same affirmance/reversal rates between cases with and without oral proceedings. On the other other hand, it could be that more “close” cases are ones where oral hearings are requested, and if the affirmance/reversal rates are the same with and without a hearing, that would mean a close case might do statistically better with a hearing. Further, if there are any misunderstandings or questions in the judges mind, it sure seems like an oral hearing is the most efficient way to resolve those issues. Another thing about oral hearings at the PTAB is that sometimes the issues that seem to be the focus of the judge’s questions turn out to be non-issues (at least on the surface). One theory is that if the attorney can win the argument on some of these close issues, the judge (who has to then write an opinion) may look to a more simple issue that enables a straightforward (and short) opinion. PTAB judges have a heavy case load and are tasked with reducing the appeal backlog. It stands to reason, therefore, that they will follow the well-established judicial philosophy of not deciding more than is needed to rule on a case. A great is example is the following ex parte appeal from Boeing (US 14/176,878). The invention is related to near-net shape manufacturing. The claimed method forms a part from a metal powder by providing a sintered preform having a sintered density, separating a portion from the sintered preform, and thermally cycling the portion (along with some additional details). The claims were rejected as obvious. If you read the briefs and the oral hearing, much of the focus is on whether the secondary reference, Fang, actually teaches the separating step as alleged by the examiner. 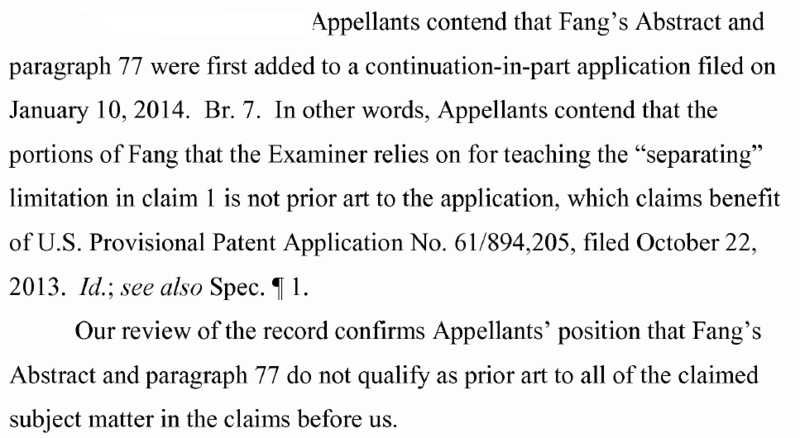 While that issue occupied a majority of the briefs and oral arguments, it turns out the PTAB reversed on a much simpler issue - whether Fang was valid prior art in the first place. So, in the end the question of whether to utilize an oral hearing can depend on many factors, and maybe the best thing that comes out of it is a reversal on a totally different issue.